Eric is responsible for the naming of the sandwich. 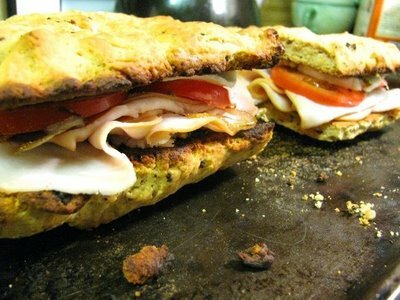 I brought his to him, and my wonderful husband made my day by saying “Whoa, this sandwich is epic!” This sandwich is similar to my cranberry bliss bars, in that Starbucks in Hawaii had a delicious oven toasted turkey pesto sandwich that I’ve been craving and wanted to create myself. Their sandwich was basically two slices of foccocia, pesto, turkey, tomatoes and a white cheese. I decided to add onions because they’re good! The white cheese I used was fresh mozzarella and the focaccia I made from a box that was on sale for $1 at Safeway. Woo-hoo! I love the discontinued shelf. 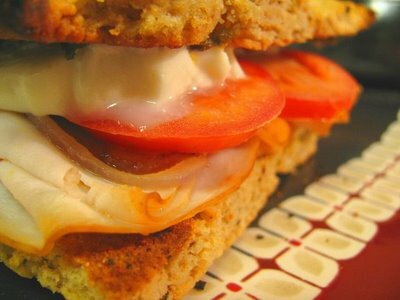 This sandwich is really pretty simple but tastes amazing. First spread each slice of bread with a pesto. I’ve been perfectly satisfied with those little $.50 pesto packets you mix with oil and water, this time I made my own and just left out nuts because I didn’t have any. It was still really good. 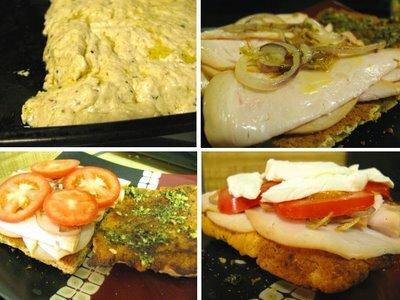 Then pile on turkey lunchmeat, sauteed red onion, fresh tomato slices, and slices of fresh mozarella. Top with the other slice of bread and toast for a few minutes in a hot oven until the cheese is just melting. Oh yeah, I think the one thing that would have made the sandwich better would be if I had made the bread right. I just read that the box said to spread it out on a baking sheet. So I used a normal sized baking sheet. But the dimensions they listed were for a cake pan sized. If I had done it in a cake pan it would have been double the thickness. I think I would have liked it better cut in half than like I made it. But Eric absolutely didn’t care. He just loved it! Epic indeed! The bread looks delightful. Jen the bread is delightful, although I hope to make some from scratch soon.